What is your biggest content challenge? Truth is, every marketer has them. 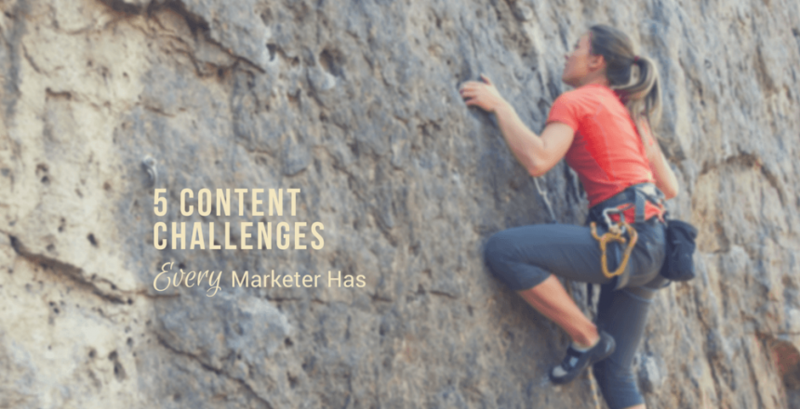 Even the biggest names in the industry have challenges in creating, curating and keeping content fresh, but because their content is so good – and their online messages are so consistent – we often think we are the only ones with content marketing challenges. I recently co-hosted a Twitter chat, #ConstChat, where we talked about content challenges (you can find the recap of this #ConstChat here). What I saw as the big challenges for this group were no surprise, but what was shared were some interesting solutions. Everyone struggles with finding enough time to create and curate content. For many small businesses, especially those in the construction industry, “doing” content marketing has fallen on the desk of an office worker who already has plenty to do. ​For blog content, this can be publishing once per week, while for others it is once a month. Most small businesses in this industry strive to publish new content to their blog twice a month. For an e-newsletter, many try to publish once a month or once every other month, as is the case with the Done-For-You Newsletter program. For social media, most #ConstChat participants indicated that they post and participate daily during the work week. For website updates (not blog), the goal is to review and identify pages to write and improve as needed, such as every time a new product is launched. Coming up with new ideas is always a challenge, no matter what industry you are in. Read other blogs/websites to get ideas (even outside the industry), and from there, make them your own. Two mentioned include Medium and Houzz. Use a Feedly account (or other similar service) where you can curate blogs in one spot. Answer questions that clients are asking you. Ask other staff members, such as customer service, technicians and the sales team, to pitch in. Highlight completed projects (i.e., project stories). Take advantage of the ideas in my 52 Content Ideas for the Residential Contractor eBook. Being consistent with content marketing is a great challenge (I know first-hand!). Even the best-laid plans get derailed due to an emergency, other duties or simply a lack of creativity on the day you’ve designated to write. One of the best solutions is to have a content inventory where you can be a few weeks ahead of schedule. Here’s how it works: Spend some time creating content for your blog, but don’t publish the posts immediately. Instead, schedule them out – perhaps a few weeks or a month from now. Meanwhile, you continue to write new blog articles (1 or 2 a week). That way, should you get sick or have another emergency come up, you are still have content that goes out consistently. For social media, schedule posts ahead of time using a scheduling tool, such as Hootsuite, Buffer or my personal favorite, CoSchedule (affiliate link). In Facebook, you can also use the native scheduling too. Curate content automatically using other tools, such as Feedly, IFTTT or Zapier. Block out time weekly when you will write new content. Schedule time every day when you will participate in social media. This means putting it into your calendar as an appointment. For example, I make a recurring appointment for every Thursday at 9am PT so I can participate in #ConstChat. You do all the work of creating this wonderful content that educates and inspires your audience, but how do you get people to SEE it, let alone READ it, in a very noisy social media environment? Man, this is a struggle for us all! Don’t just publish content to publish. Publish conent with a purpose. Make sure it’s hitting the mark on audience, message and call to action. Focus on evergreen content ideas. These are ones that won’t go out of style in a few months. From there, you can repost these blog articles over several months – or even years. Republish your content on other platforms, such as Medium or LinkedIn. Do a “Best of” blog list out to your subscribers with a link back to your top articles. Make sure that you have social sharing icons on your blog articles so others can share with their friends. In my opinion, the primary goal of your content marketing is to secure new subscribers to your list. Sure, adding followers on social media is cool and can even be fun, but the bottom line is that you don’t own those channels, so both the follower and the channels can go away or change significantly at any time. Instead, use social media channels to drive people back to what you do own – your website – and entice them to become subscribers. How? Include opt-in forms on your homepage, sidebar, popups and even embed them into the posts themselves. Trade an email address for a valuable piece of content (called a lead magnet). Make sure the content is relevant to what they are reading. Finally, don’t let content challenges derail your efforts. Find what works for you and stick to that process. Over time, I promise it does become easier to generate content, participate in social media efficiently and expand your reach.